I love that show on HGTV called "If These Walls Could Talk" where people find really great old stuff hidden in their houses and it leads them down a trail of discovery to find out cool and interesting facts about their house's original owners. I'd love to find out more about my home so I've looked over every inch of the attic and most of the crawl space under the house. So far all I have to show for it is 2 children's leather gloves, a smashed matchbox car and a bottle cap from a milk bottle. So I've had to turn to other sources to learn more about where I live. Our little house was built in 1924 and the area it lies in was only incorporated into the city recently. So on all the old Sanborn Insurance maps, it's just off the edge. I have been able to piece together some facts about the original owners of the land the house sits on thanks to Eve Bacon's Orlando A Centennial History, the definitive 2-volume set on this city's past. According to Bacon, William Benjamin Hull moved to Central Florida in 1855 from Georgia. His family arrived with 4 other families and their slaves on Christmas Day (it seems so weird to me that their were slaves in Orlando.) At the outbreak of the Civil War, Hull enlisted in the Confederacy, saw combat in Virginia and was taken prisoner at Gettysburg. After two years in captivity at Ft. Delaware he was sent home by boat and taken as far as Palatka. From that city on the St. Johns River, in the middle of summer, Hull walked home to Orlando, a trip of about 100 miles. Upon his return, he began purchasing land near Orlando until he owned 640 acres. He began building a house in 1875 that "for many years served as a landmark of the Conway area." If it was still in existence today, it would be right down the street from me. 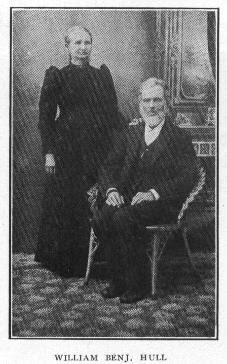 In the Early Settlers of Orange County, published in 1915 by C.E. Howard, it is written that Hull was able to buy the land because he grew cotton with business partner. Bacon writes that Hull planted an orange grove and shipped 8 barrels of fruit, making him the first commercial citrus grower in Central Florida! The descendants of the Hulls lived in the family home until it was sold and the property was ultimately subdivided at some point. A nearby street, Hull Circle, bears their name and William Thomas Hull is buried in Greenwood Cemetary just down the road. A couple blocks down the street from the Hull house was the Datson Diary, mentioned only a a couple of times in in Bacon. In 1926 B.C. Datson announced plans to built a $200,000 dairy plant near downtown; later that year he was killed in an a car accident and his son's took over running the the dairy. In 1927 the sale of dairy equipment and livestock is noted. 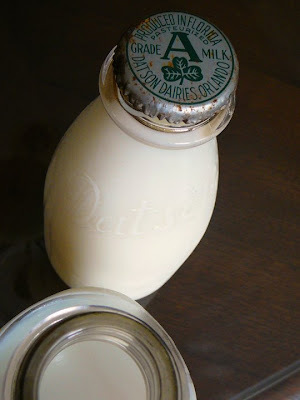 Then in 1951 the dairy was sold to Borden. 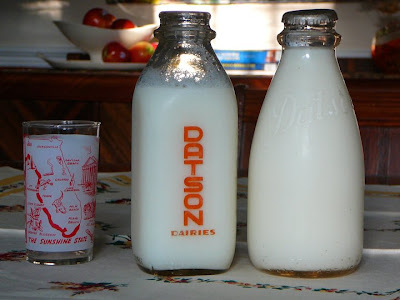 I was able to find some Datson milk bottles on EBay, and a photo of one of the Datson's on the UF Library website, but that's all I have so far. Have you looked in old city directories? I HAVE READ YOUR PAGE, MY HOME WAS BUILT BY THE MR.DATSON OF YOUR HISTORY INFO.IN 1926,THE FARM WAS LOCATED ON THIS PROPERTY FOR A WHILE AFTER HE DIED AND MY HUSBANDS UNCLE AND FATHER TOOK OVER THE RANCH AS MOVED THE PLANT STAYED IN DOWNTOWN UNTIL THE FAMILY SOLD THE DAIRY . 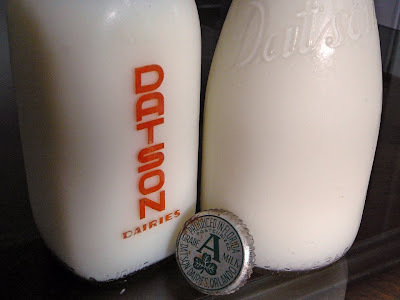 I bought the Datson Dairy house in approx 1986? A very old lady at the time told me stories about when she was a child she watched the men cut down the trees, on the property and build this house which she said was the Datson Dairy house. I vaguely remember seeing a very old deed with similar information on it. She said they cut down the trees, then cut them with their wood splitter on my front yard, then played their guitars, ukuleles, and harmonicas, ate BBQ, got drunk, passed out on the lawn, and started all over again at the next sunrise. She said at the time it was still a dirt road, not paved. The address is 1324 Cloverlawn Ave Orlando 32806. If anyone has any info please contact me at the following email. I forget to mention that I still live in the Datson Dairy house. This house is still incredible. I rode out all of the hurricanes in this house without any damage except for trees down. Am considering selling it and moving to the gulf coast. The back yard is fully fenced in, large shed, cement pad, mature avocado tree, ruby red seedless naval orange tree, mature gardenia bush, night blooming jasmine. The front yard has banana trees, mature queen palms, and to much more to mention. Would appreciate any information and advice.